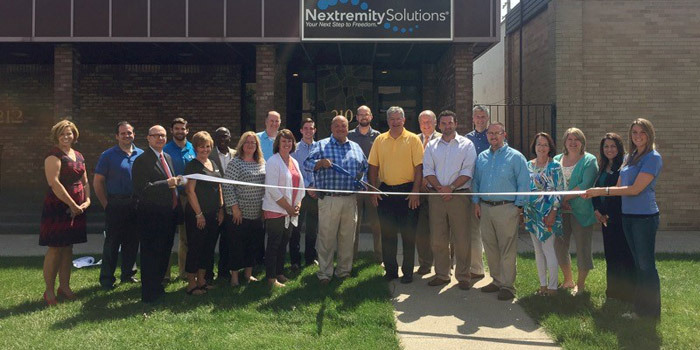 Kosciusko Chamber of Commerce held a ribbon cutting at Nextremity Solutions, located at 210 N. Buffalo St., Warsaw. Nextremity Solutions, Inc. is a privately held medical device company offering novel solutions and approaches to forefoot surgical intervention. The company’s procedure ready, sterile implant systems for the correction of the forefoot pathologies include uniquely precise, proprietary technology designed to achieve repeatable and superior clinical outcomes. Nextremity Solutions was founded in 2008 in New Jersey and in 2013, relocated its corporate headquarters to Warsaw. Nextremity Solutions was named a 2014 Indiana Company to Watch by the Indiana Chamber of Commerce.